Ever since programming languages are introduced, developers all over the world are building future rich software applications. Sometimes, there occurs certain complexity which might cause the development to be cumbersome and lengthy. There enters the need for more structured development that facilitates scalability and long-term maintenance. This give rise to the existence of “Framework”. With the help of right framework, one can ease out the development process and lessen the time takes for it. As there are many technology frameworks available currently, it can be daunting to choose the right framework for your project. 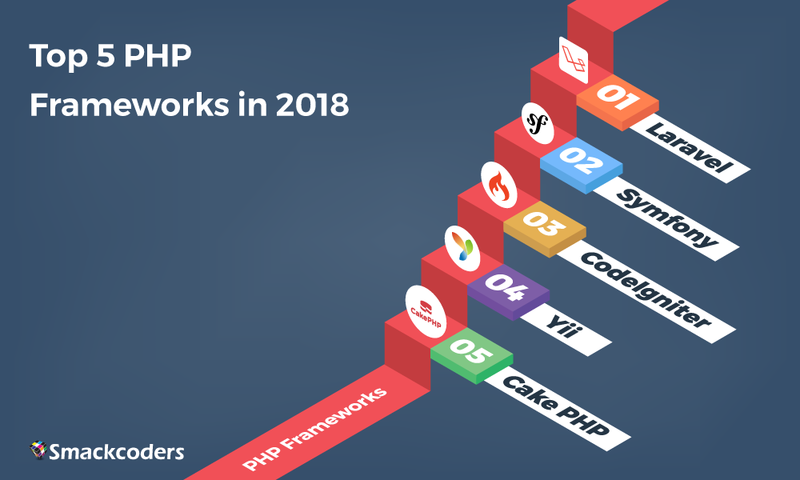 In this article, we got you covered with the top 5 PHP Frameworks in 2018. PHP is the most popular and widely adopted server-side scripting language for web application and dynamic website development. Today, there are no. of PHP Frameworks available in the market, which helps web developers to develop & deploy more complex web applications. But before getting into this in detail, let’s have a quick look at what is a PHP Framework and how it improves the developer’s efficiency. PHP Framework is a web development architecture which consists of methodologies, reusable codes, and components for rapid application development(RAD) that help developers to build stable web applications. How it beneficial to developers? Speeds up the development process by automatically creating core functionalities like CURD. Offers many input and output filtering functions which adds an additional security layer to your web applications. Have their own specific debugging methods. Easy to organize your code and file. Out of all, the most important is PHP Framework has a great active community support. Now let’s deep dive into the topic. 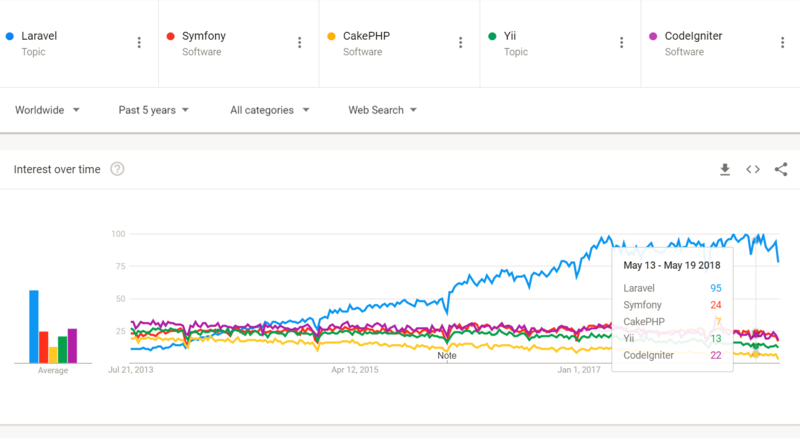 From the longest list of available PHP Frameworks, here we listed the top 5 based on our recent analysis on Google Trends. Just have a look at it. From the above image, it’s clear that Laravel holds the first place of all the other PHP Frameworks. Laravel is a free and open-source framework that follows an MVC Pattern, created by Taylor Otwell as a better alternative to CodeIgniter framework. A lightweight template engine called as “Blade” – Helps you in different tasks like authentication, caching, sessions, routing, queuing and more. Artisan – A built-in command line tool, allows you to perform the most of the tedious and repetitive task. MVC Architecture – Allows you to speed up the development process and improve performance. Unit Testing – Lets you run many tests, ensure that the new changes won’t affect any other thing in the web application. Eloquent ORM – Gives the ability to issue database queries in PHP syntax & avoids the hassle of writing SQL code. Security – Laravel offers you with a built-in security. It uses “Bcrypt Hashing Algorithm” to better secure your passwords. Doesn’t work on shared hosting. The next most recognized PHP Framework in our list is Symfony. It is a reliable, modular and high performing framework developed by Sensio Labs with an aim to speed up the creation and maintenance of web applications. Offers High Performance due to the use of Bytecode caching. PHP libraries are reusable, which helps in different tasks like routing, authentication, templating, object configuration and more. Well documented and excellent support system. The next framework in our list is CodeIgniter. It is a simple, flexible, lightweight and easy to use free PHP framework created by Rick Ellis. CodeIgniter is often known for its speed when compared to other Frameworks. Offers a strong security as it includes built-in protection against XSS, CSRF such attacks. User-friendly interface lets you develop a dynamic, flexible and secure web application. Exceptional performance capabilities and outperforms most of the other frameworks. Provides you with a clear, easy to understand documentation, tutorials and user guides. Easy to spot error functions. The PHP Framework which occupies the 4th position in our list is Yii PHP Framework. It is a fast, secure and high-performance PHP Framework, started as an attempt to overcome the drawbacks of the PRADO Framework. Yii is known for its easy installation and extendability. Follows MVC design architecture and offers a strong caching support. One of the oldest PHP framework and provides support till data. Your code easily gets messy, if it isn’t organized properly. Finally, the last Framework in our list is CakePHP. It is easy to learn with CURD embedded in it. It started, when a polish programmer Michal Tatarynowicz wrote a minimal version of RAD in PHP. Offers a built-in caching, authentication, database access, and more. Lets you prevent cross-site scripting and SQL Injection. Follows Zero configuration, so you no longer need to specify the library location or site URL, everything is auto-detected. Easy to run the test to check the critical points of your web application. Not good for the construction of Restful API as like any other PHP Framework. So far we’ve seen the top five PHP Framework, that are future-ready frameworks and consists of countless features to provide you with an amazing web development experience. We hope that this article will help you to narrow down your selection list. If you have any questions, feel free to drop your query in the comments below.